All Good Wishes Due Out August 3 via E.L.K. 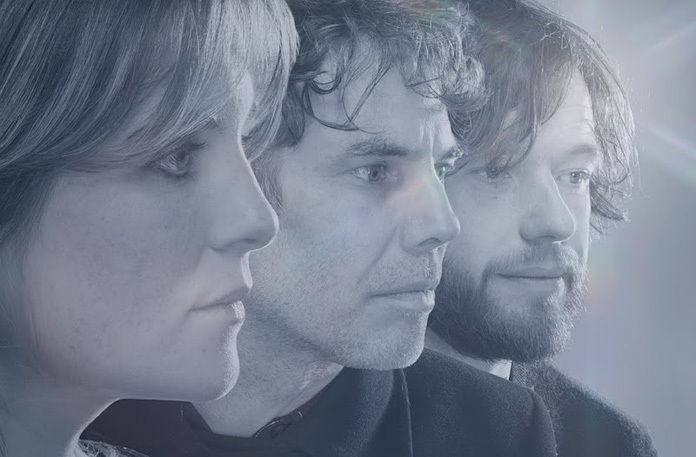 Gulp is a psych-pop trio that includes Guto Pryce of Super Furry Animals and also features his partner Lindsey Leven and their longstanding guitarist Gid Goundrey. The band is releasing their sophomore album, All Good Wishes, on August 3 via E.L.K. Previously they shared the album's first single, "I Dream of Your Song." Now they have shared another song from the album, "Claudia." Listen below. The band has this to say about the song in a press release: "'Claudia' was inspired by a hand drawn comic book picked up in New York City, who's character tried to catch the moon. Musically we channeled '60s Tropicalia and '80s synth anthems." All Good Wishes is the follow up to their 2014-released debut album, Season Sun. Since their debut, Pryce and Leven had their first child and moved from Cardiff, Wales to the Scottish east coast. Pryce had this to say about the album in a previous press release: "I think all through making this record we were looking at relocating. Whereas the first record was more of a road trip this is possibly a bit more focused on home, and focused on where we're from and where we're looking to go to. It's partly a farewell to Wales, and hello to Scotland." Luke Abbott then mixed the album in Norwich, England. "We spent a lot of time on road trips listening to music, experiencing and enjoying different landscapes," Pryce reflected in the press release. "It's especially apt in these times to see the good side of human nature; despite what the media portrays, people are generally sound, and it's great be reminded of that in day-to-day living." Read our 2014 interview with Gulp. I will surely share it with my other mates as I will be free from my <a >new year tours</a>.